I’ve never been a fast food nazi. Fast food is a nice luxury to have when life is busy. Just don’t eat it everyday. 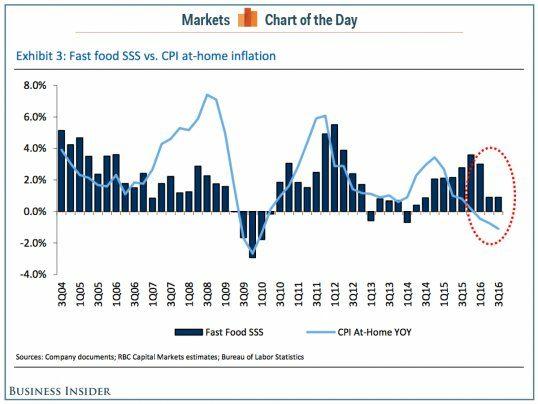 The real reason may be a bit simpler: It’s getting cheaper for Americans to eat at home. The price of food at grocery stores has actually been on the decline since the end of 2015, based on the Consumer Price Index for food at home. In fact, in July (the most recent data available), the cost of food at home declined 1.55% from the same month a year ago. On the other hand, the cost of food away from home – what you pay at restaurants – is still on the rise. In July, prices for food away from home rose 2.79% from same month last year. ← Previous Post Do college graduation rates show “white privilege”?